Spruce up your holiday cookie tray or cookie exchange with these 9 unique holiday cookie recipes! All of these cookies would be perfect for gifting, especially for that person that has everything! Can you believe that this is where we are already? In December with holiday cookie baking already in full force? Holiday cookie baking is my favorite time of the year and I will savor every moment of it! If you’re anything like me then you are constantly in search of unique holiday cookie recipes this time of year! While I am definitely not a picky cookie eater and still love all the traditional holiday cookies, I love discovering new cookies to share with family and friends. So today I wanted to round up a few of my favorite unique holiday cookies that I have discovered are sure to impress you and anyone you share them with! I love the idea of bringing any of these cookies to a cookie exchange because they will likely be the only one of their kind there! Any of them would also work well for gifting, especially for that person that has everything. Start some new family holiday traditions by trying out some of these truly unique holiday cookies! Making Ahead: They can be made months ahead of time and their flavor continues to develop with age. Making with Kids: The process of rolling out the dough into thin snake like shapes is fun for the whole family! 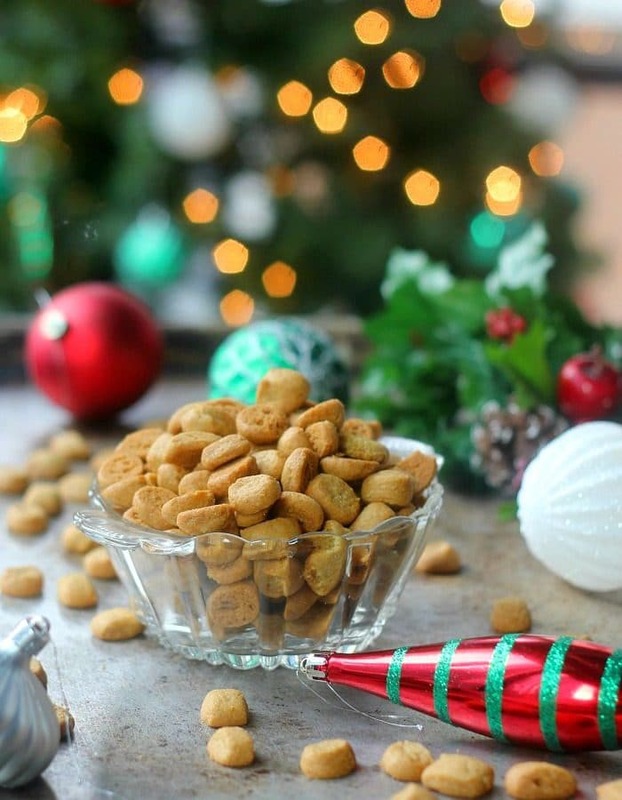 Large Batch Gifting: One batch of Peppernuts makes about 12 cups of tiny cookies. This makes them perfect for splitting up into tins or pretty bags to gift all throughout the holidays! Scoop and bake cookies are perfect for those who don’t feel confident in their dough rolling skills or decorating technique. 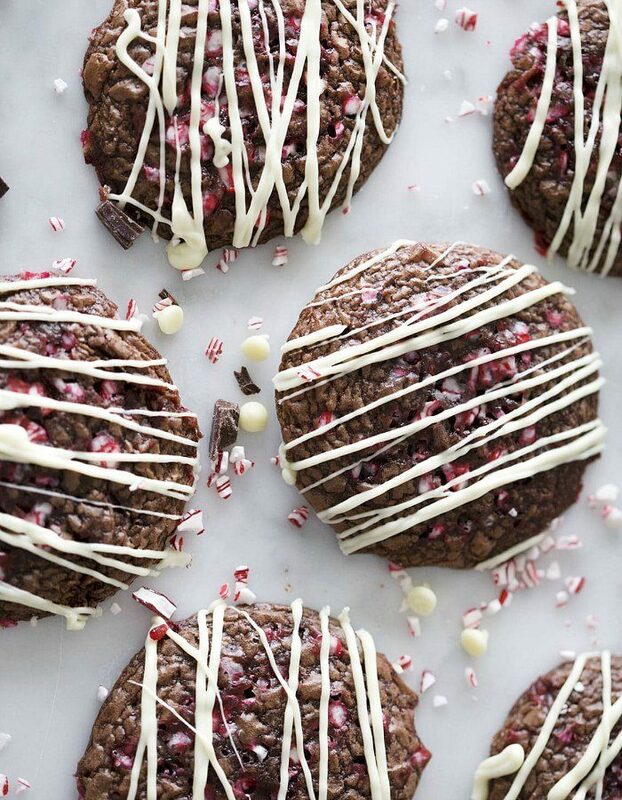 These intensely chocolaty cookies look so beautiful with peppermint pieces peeking through and a simple white chocolate drizzle. Bringing to a Party: You just can’t go wrong with bringing anything chocolaty to a party! The contrast of the snowy white and dark brown chocolate look so pretty on a holiday table! Leaving Out for Santa: The kids will feel extra proud to leave these special cookies out for Santa. They will definitely stand out among all of the simple chocolate chip cookies the other kids are leaving him! While traditional fruitcake gets a really bad rap, these beautiful and delicious fruitcake cookies will be the talk of your cookie exchange! 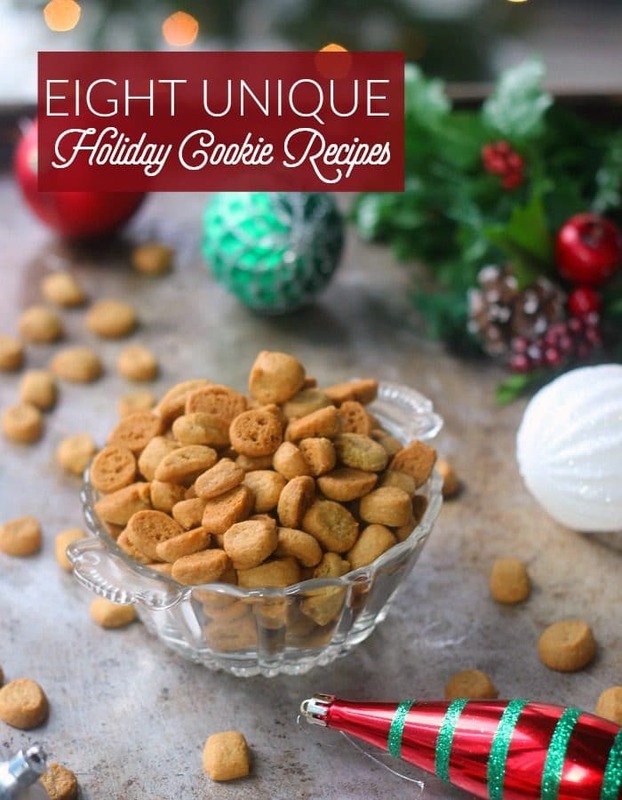 I love unique and novel takes on classic holiday treats, and this one does not disappoint! White Elephant Gift Exchanges: While nobody may want to be stuck with the real fruitcake during a white elephant exchange, whoever winds up with these fruitcake cookies will fall in love with them! Cookie Exchanges: Cookie exchanges are all about being able to try all kinds of cookies you may have never had before. 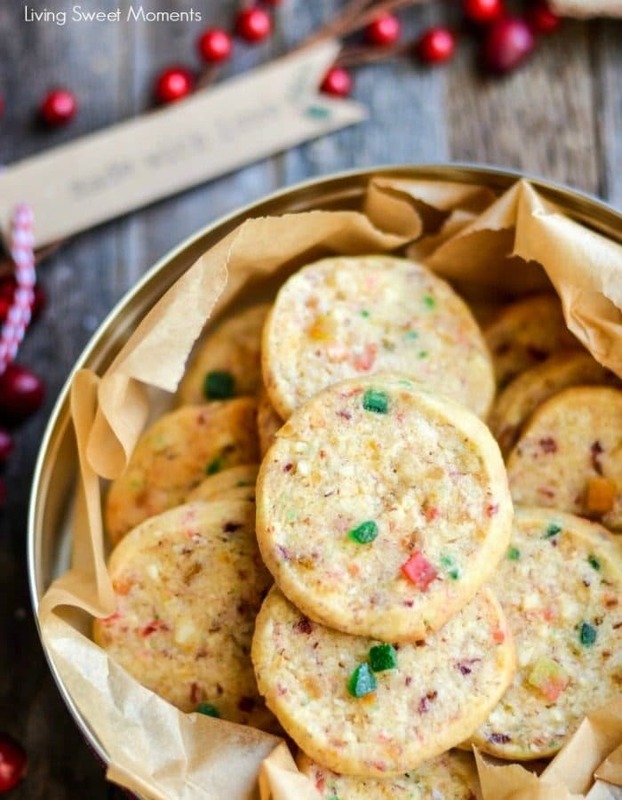 These fruitcake cookies will be a wonderfully unique addition! One of the things I love so much about biscotti is how few ingredients are required to make the basic dough: flour, sugar, vegetable oil, baking powder, and eggs. Gingerbread biscotti is such a delicious winter themed variation! Dip in dark chocolate and top with flaky sea salt and you have an incredible gift for the foodie on your list! 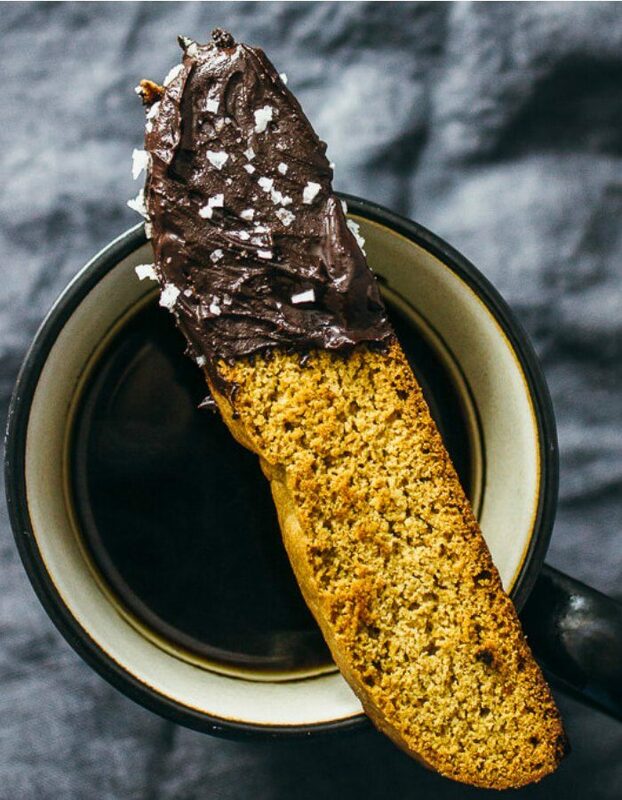 Gifting to the Foodie or Coffee Lover on Your List: These biscotti would impress any foodie or coffee addict on your list! Pair with a bag of beans from your favorite local coffee roaster and you are set! Making Ahead: Biscotti hold up well to being kept for a long time. Packaged in an airtight container, the cookies will keep for up to 4 weeks making it easier to check things off of your holiday baking and gift list! 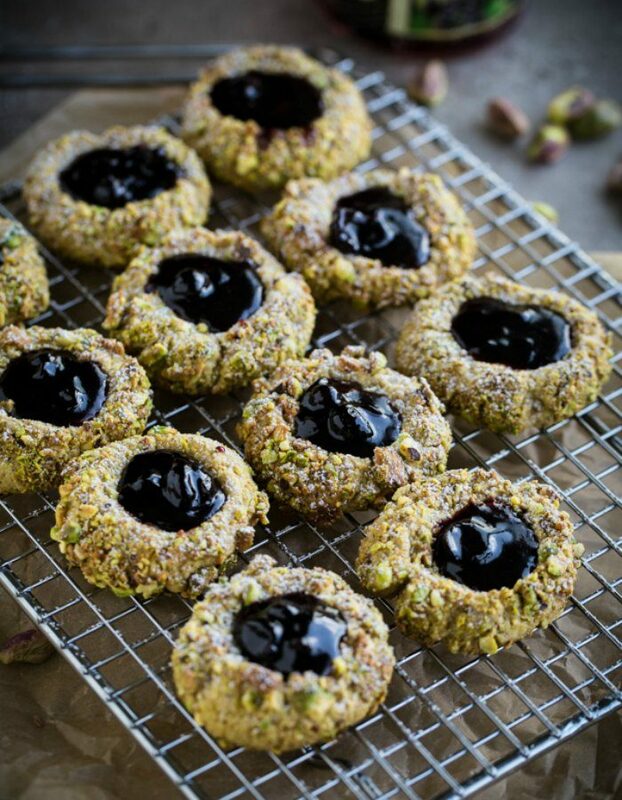 Thumbprint cookies are a classic holiday tradition, but this pistachio version is certainly kicked up a notch! Paired with Black Current Jam (or any other tart jam your prefer), this unique take on the classic holiday cookie will be sure to impress! Gifting to the Person Who Has Everything: We all have that person who seemingly has everything! These beautiful and classy cookies aren’t your average holiday cookie gift and would look beautiful in a pretty tin! Holiday Baking with the Family: Though very simple to make, these pistachio thumbprints have a few steps to them, including dipping them in egg whites before rolling them in pistachios and then making that thumbprint indentation! These cookies are perfect for making with the family or a group of friends! Don’t even ask me how to pronounce their traditional name, but I know that these Polish Honey & Rye Cookies are delicious all the same! Rye flour is made from a grain that is closely related to wheat, but it has more of a rich and earthy flavor to it. 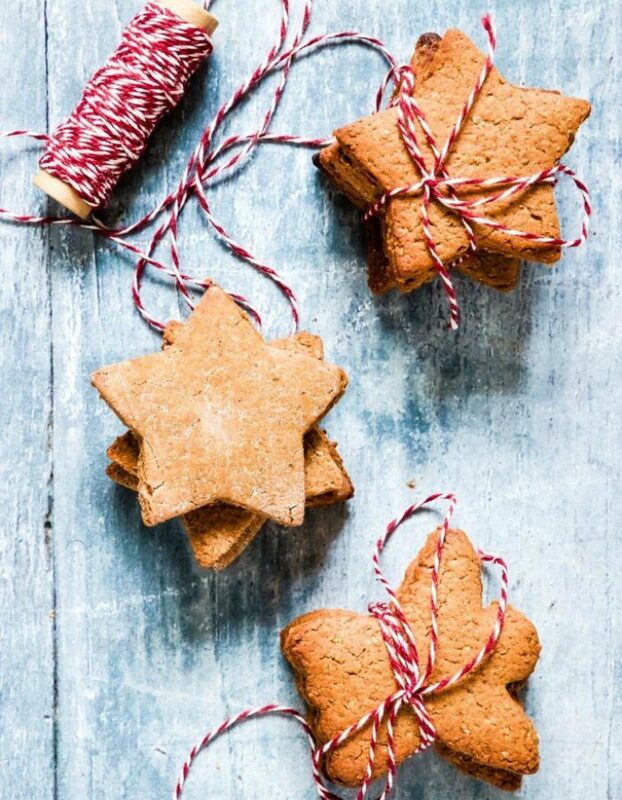 Paired with honey and spices, these unique cookies taste slightly reminiscent of gingerbread. Quick Baking: This cookie is extremely quick to make! The butter is melted, eliminating the need for it to come to room temperature, and the dough does not require chilling. These cookies can be ready to eat in under 20 minutes! Making with Kids: Let the kids cut out their favorite shapes of these beautiful cookies! The quick process from start to finish also makes these great for kids who get a little impatient! These absolutely stunning meringue kisses are incredibly light and delicate. 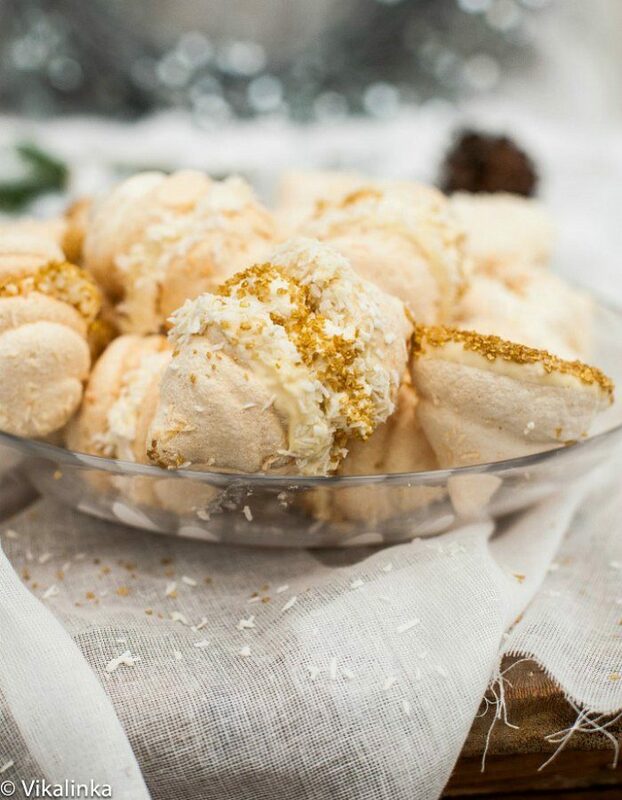 Sandwiched between a mascarpone vanilla cream and dusted with coconut flakes and gold sugar, these cookies are beautifully festive! A Light Dessert after a Heavy Holiday Meal: I love how light meringue cookies are! Especially after a heavy holiday meal, these beauties are the perfect delicate ending! A New Year’s Eve Party Dessert: The addition of the gold decorating sugar makes these cookies perfectly festive for a New Year’s Eve celebration. This unique take on Russian Teacakes, also known as snowballs or nut balls, are soft and buttery with a melt in your mouth texture! The tartness of the cranberries mixed with the crunch of the pistachios make these a real holiday favorite! 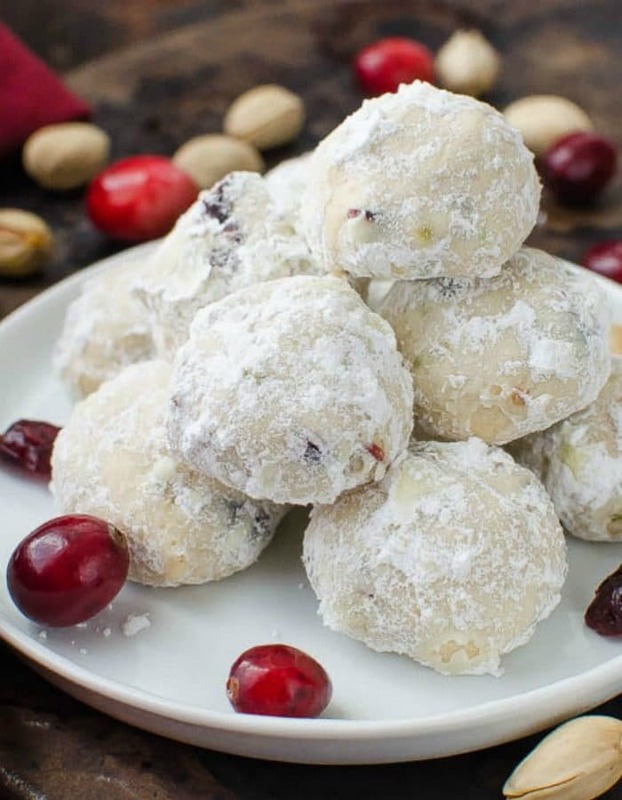 Giving Holiday Traditions a Face-lift: Russian Teacakes (or snowballs) are a holiday tradition in so many families! This unique take on the classic would be a wonderful way to to freshen up those traditions! Serving with Tea or Coffee: These beautifully buttery cookies are such a wonderful dessert to nibble on with hot tea or a strong cup of coffee! In addition to trying new and unique holiday cookies, I have to make a big batch of my favorite Sour Cream Sugar Cookies every year! They are a family favorite and an absolute holiday must have! I would love to hear from you what your holiday baking traditions are! Do they include cookies and if so, what are your favorite kinds? yesss-love this round up! All the cookies are totally perfect for the holidays! Thanks, Kayle!!! They are all so beautiful!